When I started this blog back in Aug 2007, it was a spur of the moment decision, as I wanted to try my hand at blogging in a less frivolous manner than what blogs back then (and perhaps even today) stood for. There were blogs, and there were blogs. An entire spectrum still exists today - from technical and information-rich blogs to the casual and personal diaries of individuals keen to share their perspectives to whomever has the time to read their rantings and trivia. 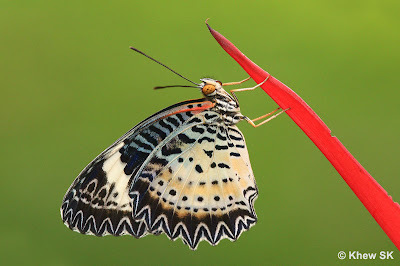 The Butterflies of Singapore Blog is now moving into its fifth year since the first article was published, and I hope that it will continue for as long as there is information to share about our beloved butterflies, and the exceptional photographic talent of my friends from ButterflyCircle to showcase to the world. 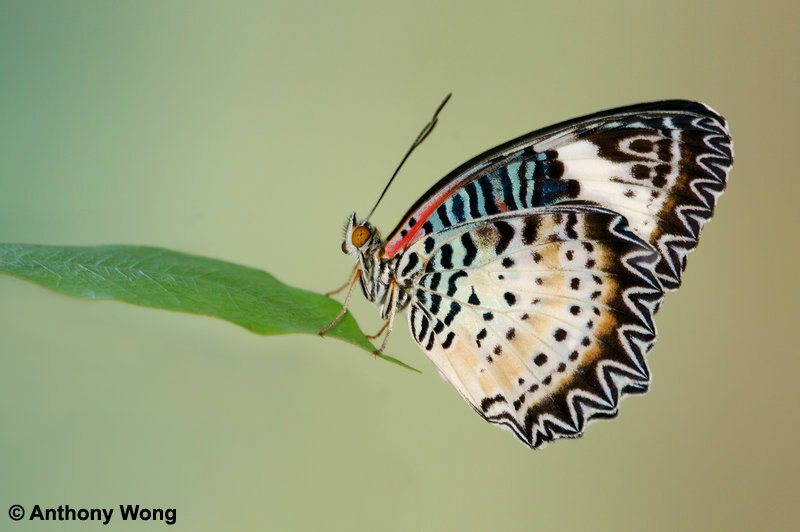 Special mention must be made too, of my fellow-blogger on this site, Horace Tan, who has meticulously and painstakingly recorded so many butterfly species' early stages - some of which has been recorded in such detail for the first time. Horace's work far exceeds the work of any amateur enthusiast that I know of, and sets the benchmark, both in photography of the early stages of butterflies, and the scientific write-up that accompanies each impressive blog article. 2012 started off quietly enough, as unique challenges continue to plague each geographical region all around the world. Amidst all the sombre news as we bade 2011 goodbye and welcomed 2012, there are always optimistic outlooks and predictions in the year ahead. Doomsday theorists predict that the end of the world is nigh, and that day will happen on 12 Dec 2012. This day, which happens to be a Wednesday, marks the conclusion of the b'ak'tun - a time period in the Mesoamerical Long Count Calendar, usually associated with the Mayan civilisation. Prophetic beliefs hold that the world, as we know it, will end on this day, caused by a cataclysmic event, and where time on earth ends. Even Hollywood jumped on the 2012 Phenomenon with a movie, aptly titled 2012. If fantasy is to be believed, somewhere in China, a whole bunch of people would almost have completed the construction of a number of arks to save a select group of Earth's most illustrious and financially well-endowed citizens. 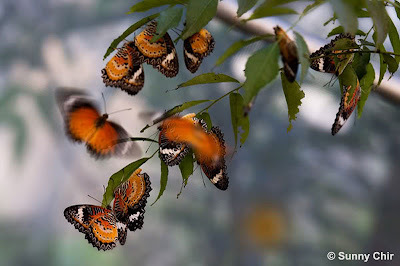 Back to a more optimistic frame of mind, nature still has a lot of beauty for us to enthrall and amaze our senses. Let's leave the end of the world to the people who prefer to see things that way. January's birth flower is the carnation, a pretty flower that comes in all manner of colours. A species that originated from over 2000 years ago, and originally came in only pink, there are many cultivars today that adorn flower arrangements and myriad uses that celebrate the flower's beauty. 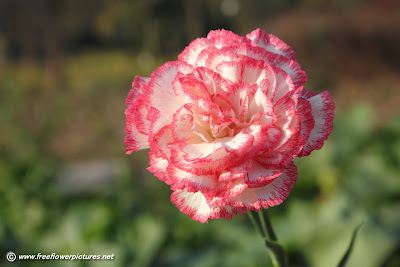 Dianthus caryophyllus as scientists know it, represents various meanings to different cultures and even the colours stand for a variety of interpretations from admiration, deep love, luck and capriciousness! 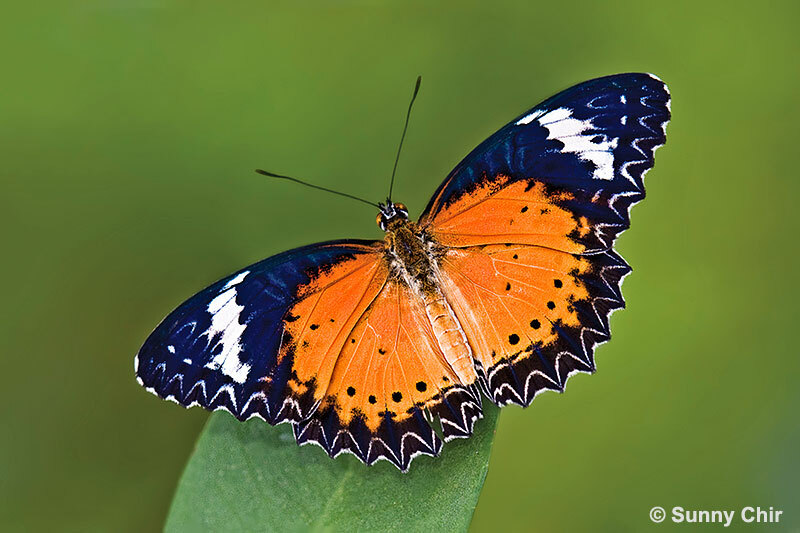 In our world of butterflies, we start the new year off with a colourful and very attractive butterfly, the Leopard Lacewing (Cethosia cyane). This species belongs to the subfamily Heliconiinae of the Nymphalidae family, of which many of the species are feeders of the host plants from the Passion Fruit family. Many of the species are colourful and attractively patterned, and display aposematic colouration. 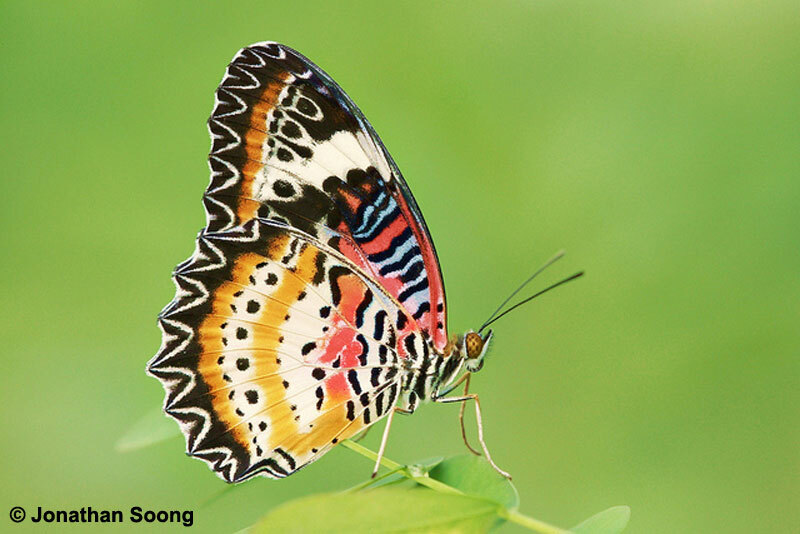 The Leopard Lacewing was not recorded in the early authors and researchers' lists of butterfly fauna in Malaysia and Singapore. The species has a range spanning from India to Southern China, and its arrival in peninsula Malaysia and Singapore is fairly recent. In his paper in the Malayan Nature Journal Vol 59 Part 1 Oct 2006, "Updating The Butterflies of the Malay Peninsula", the late Col John Eliot added the Leopard Lacewing (Cethosia cyane) and attributed its discovery to Arshad et al in 2000 from the Langkawi Islands. Coincidentally, I happened to be on Langkawi that year, and captured a number of the species for record. 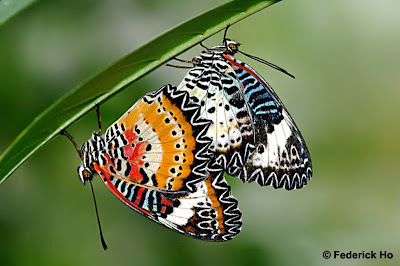 These specimens are featured in Col Eliot's article's accompanying colour plates, showing a male and female of the Leopard Lacewing from Langkawi Islands. 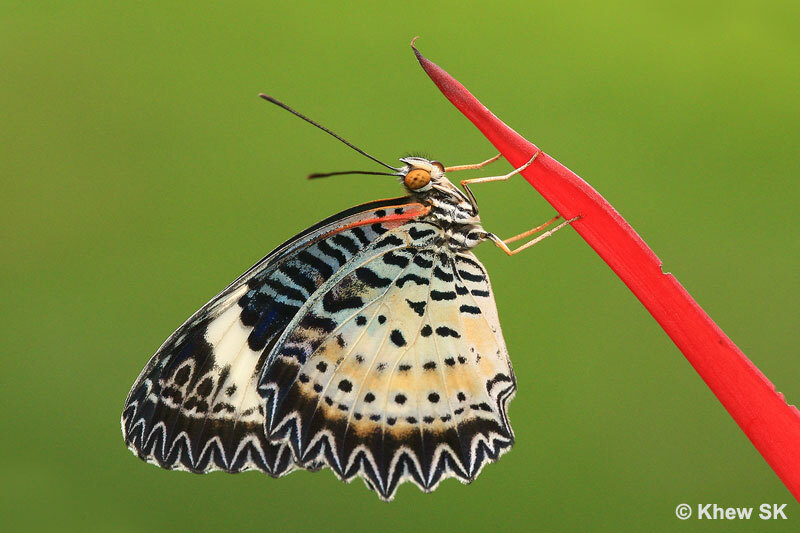 Not much data is available of the spread of the species southwards in the Malay Peninsula. 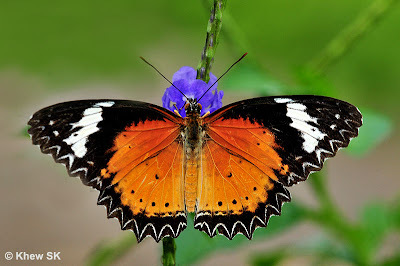 The first record of a sighting of a female of this species was during an official biodiversity survey in the Western Catchment area on 13 Dec 2005. A voucher specimen was taken, and recorded in NParks' survey data. 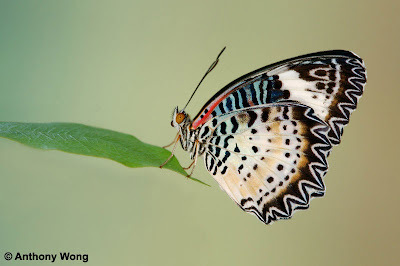 Another female was spotted at the Upper Seletar Reservoir Park on 7 Jun 2006, and thereafter, the species became very widespread across Singapore wherever its host plant, which it shares with the Tawny Coster (Acreae violae) another immigrant, is found. 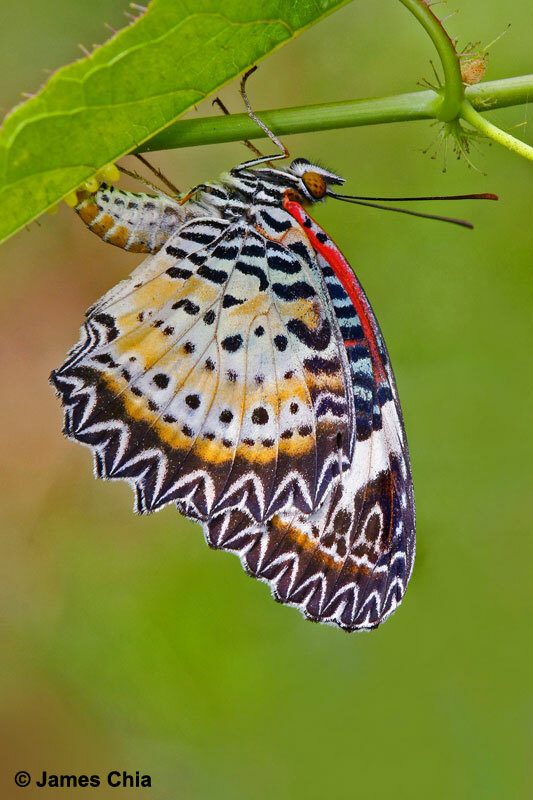 The male Leopard Lacewing is orange above with black apical and submarginal borders. 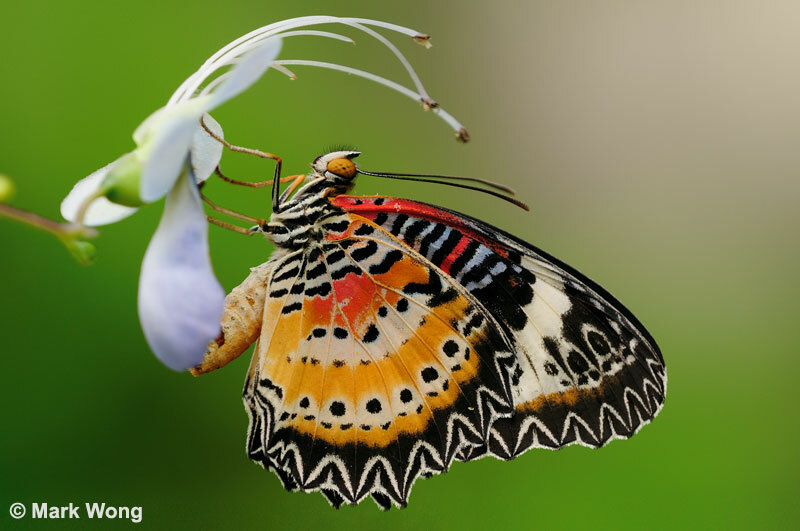 It appears similar to its two related species - the Malay Lacewing and the much rarer Plain Lacewing. The distinct and large submarginal black spots on the hindwing above sets it apart from the other two species. 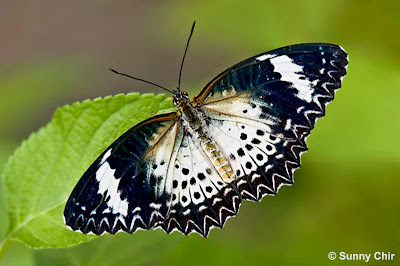 On the underside, these black spots, set in a narrow white submarginal band, distinguishes its two closest relatives. 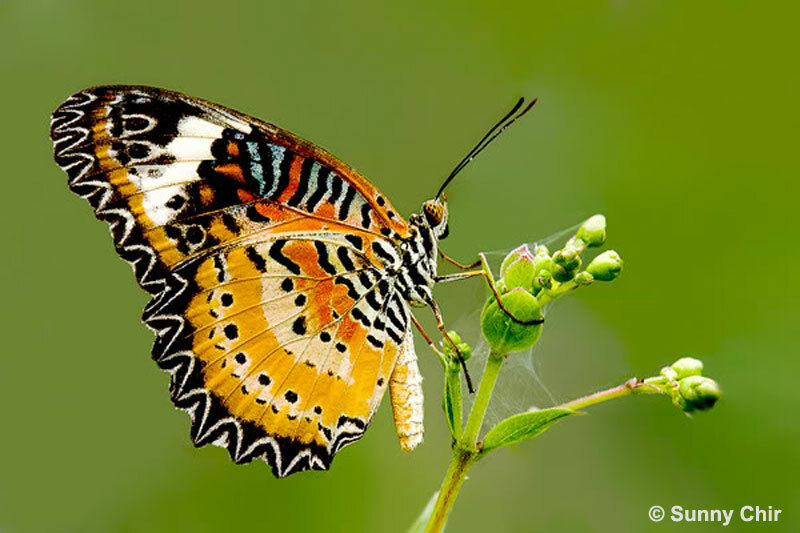 Female Leopard Lacewings are a pale creamy yellowish-salmon coloured above and have a similarly coloured dorsal patch on the forewing as the males. 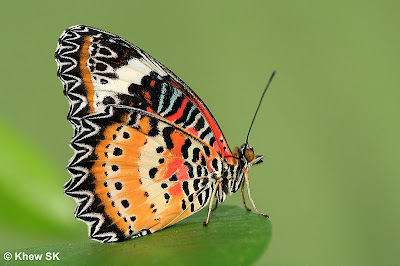 The underside also features the same pattern as above, and the ground colour is also the pinkish-salmon colour. 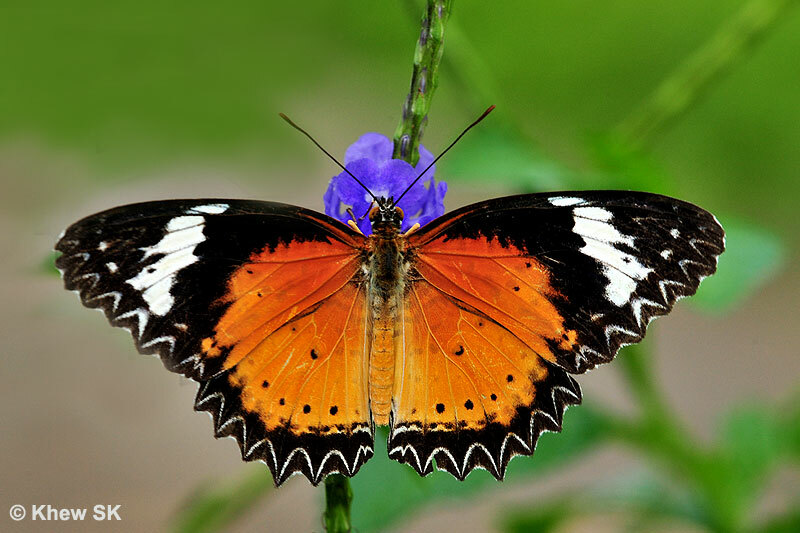 The butterfly is common in open areas as well as the forest edges where its host plant, Passiflora foetida (Stinking Passionflower) is found. The plant is a secondary forest "weed" and appears whenever there are areas cleared and left untended for periods of time. 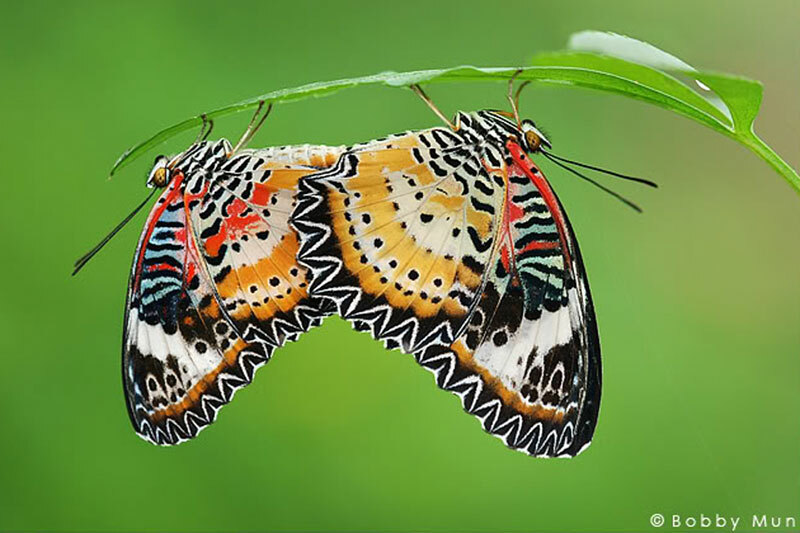 The female Leopard Lacewing oviposits a large number of eggs on the underside of a leaf of the host plant, and the caterpillars can defoliate the plant very quickly due to the sheer number that usually hatch from the 20-50 eggs per clutch. The caterpillars feed together in a group, until the late instars. 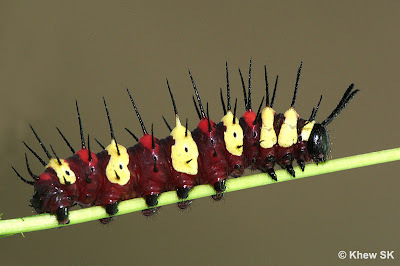 Attractively striped in cream and deep red, the caterpilars also display aposematic colouration to display to predators that they are distasteful. 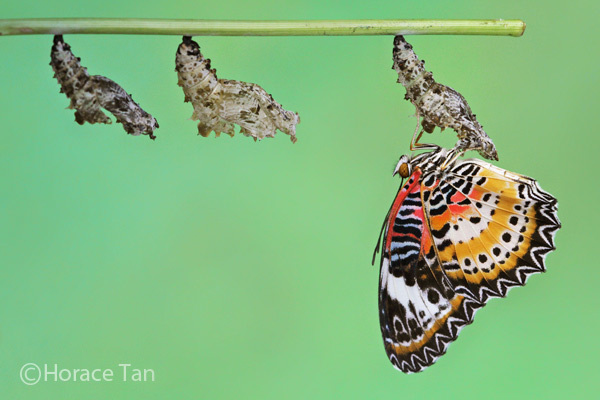 The pupae are oddly shaped and variable in colour and well camouflaged when in the undergrowth. 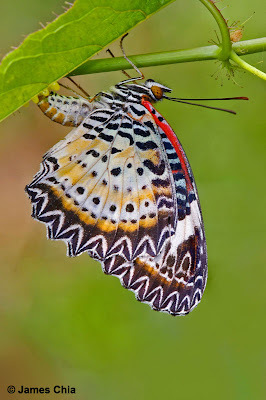 The Leopard Lacewing is easy to breed, and is one of the feature butterflies that are fairly common at Oh' Farms Butterfly Lodge, a facility set up for educational research and conservation of butterflies by a private sector organisation in Singapore. 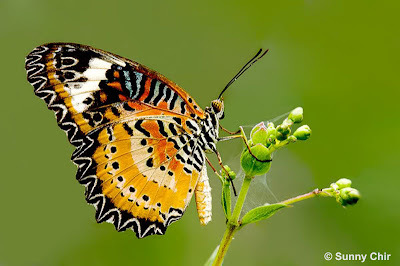 As we start off this first month of 2012 with this very pretty and attractive Leopard Lacewing, we look forward to 2012 (and beyond the "end of the world") and to more butterfly stories in this blog. On behalf of ButterflyCircle, we take this opportunity to wish all our Chinese readers and members a Happy and Prosperous Year of the Dragon and Gong Xi Fa Cai! Whoops I think I posted on the wrong thread just now. Meant to say thanks for all the information I found here on the Leopard Lacewing, and here's our experience rearing one. Thanks for all your help. I needed to write an autobiography in school so it helped a lot. I got inside the mind of a butterfly. Thx a ton.